Death star creme eggs and other eggy treats. This Easter, I decided I really really NEEDED to make Creme Eggs. And if you are going to make a Creme Egg, why wouldn't you upgrade the design? 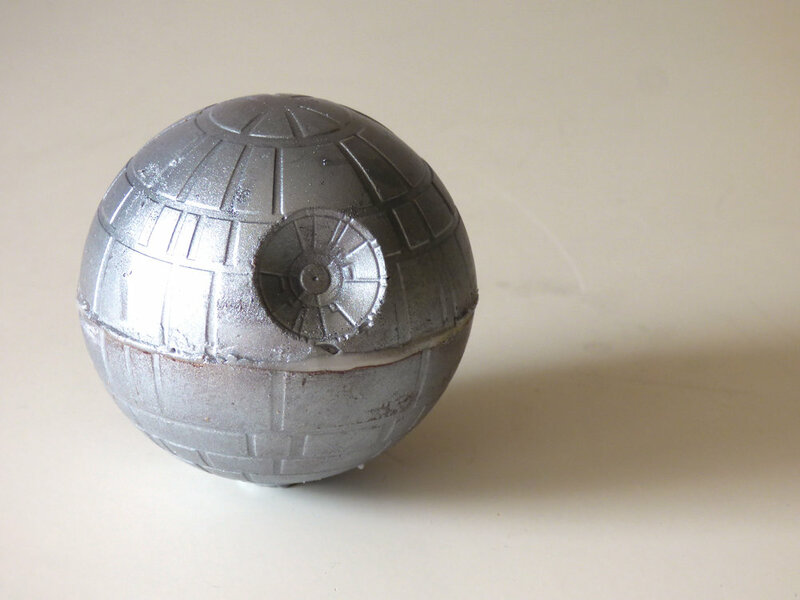 I decided I had to make them in the shape of the Death Star, and couldn't rest until I'd managed it. I dusted the inside with Rolkem silver lustre, but you could skip that bit if you want it to look chocolatey. Then you need to coat each half with melted chocolate. I found the easiest way was to fill both halves with chocolate, then leave it for 10 mins or so, and pour it out. You need quite a thick layer so that it doesn't crack when you de-mold. Leave it for a good while to set in the fridge till it's really tough and then ease it out of the mould. Just spoon the white gloop into both halves, then add a bit of yellow in the centers. Then calmly and probably messily, join the two halves together. I used royal icing as glue. I also made the traditional pimped eggs for the family - I tart up some basic easter eggs with modelling chocolate. This year we had: Roger Moore, a Porg, Frida Kahlo, Chewbacca, Princess Leia, and Hedwig. This post has nothing to do with wedding cakes - but everything to do with having fun with your food! Every year I give my family's easter eggs an up-grade. I've blogged one instructions (very loose instructions....) before, click on the "Easter Eggs" link (at the bottom, or over there --->) to find it. Here are this year's eggs! Golden Snitch egg...with edible wings!! Wilson from castaway easter egg! My new year's resolution was to blog every week. Oops! It's March. Never mind - here is my first proper post. If you click 'like' at the bottom you can see hearts fly! Every year, tradition demands that I 'pimp' my kids' eggs. That basically means, adding bits of icing to make a shop-bought egg look cooler. Or that's the aim, at least. Now, I'm not pretending that this is anything close to a 'tutorial', because that would mean that I was some sort of Egg Pimping expert. (Eggspert?) Whilst I've done it every year for a good few years, I'm still making it up as I go along. Every year, without fail, it's the very last thing I do on Easter Saturday - at about 1am. It's late, and I'm tired. But we all know that 1am is the best time for parental creativity - especially when expectations have been raised beyond belief, right? So, with apologies for the lack of step-by-step instructions, here's some things I've learned along the way. I've got an easter egg mould....which I've never used. If you can temper chocolate then by all means, make your own, but if - like me - you're doing this at midnight ad can't be bothered, then don't beat yourself up. I use the eggs that come in minimal packaging, for obvious reasons but also because they tend to have the sweets on the inside of the egg, which is critical in my opinion! I tend to use what ever bits of sugar paste, modelling paste or modelling chocolate I have kicking around. If you don't make cakes for a living you may not have cupboards full of sugar paste. You can use the supermarket 'ready to roll' stuff, or coloured marzipan, or anything you can find. For bold colours, ready-coloured is best. Modelling chocolate is great, too, and very easy to make using Wilton Candy Melts and liquid glucose (check the wilton website for the recipe). The question I am most often asked is 'how do you stick it all on?'. I usually find that the sugar paste is sticky enough by itself - and after all, I'm making this at 1am, the kids will be up at 6am, it doesn't have to cling on for long. You can use a bit of royal icing if you're worried, or melted chocolate, or water. My number one tip is probably an obvious one (but it wasn't to me)...chocolate melts at body temperature. When I painted the Beatrix Potter egg, I held it in one hand and - of course - my fingers left melted holes in the chocolate! 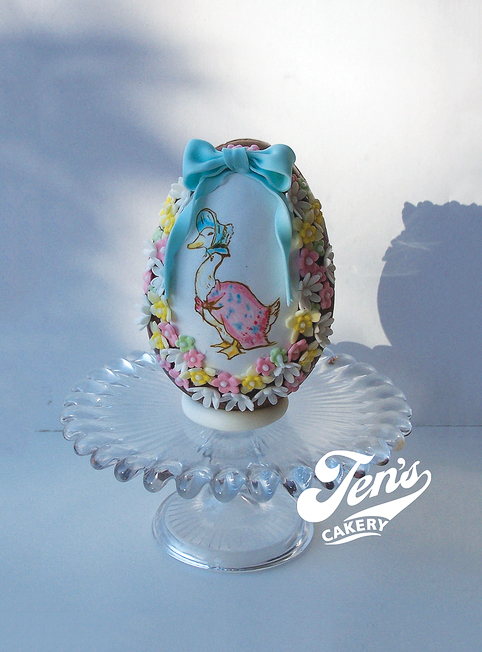 Make a little 'bed' to sit the egg in while you decorate with a bit of sugar paste or some crumpled up cling film. I use a squished ball of sugar paste to hold the egg upright once it's done, too. For this year's eggs, the designs meant that I needed to cover the whole egg in coloured paste. Or does it? Actually, I only cover the front, so the back isn't covered. much easier, and trust me - your kids won't complain. I just slap the rolled-out sugar paste on and then neaten the edge with a sharp knife. #marchmeetthemaker day 31: "product in use/wild" . I think this fits the brief pretty well thank you! I love this picture so much, it's shown here with the permission of photographer @willpatrickweddings and bride @annabel.jayne 😘 . 📷🤺🍰⚔️🌵 . . Thanks also to @joannehawker for #meetthemaker. Suprised I kept up but it's been brilliant. More opportunities to look outward and meet makers who are making things that I didn't even realise existed, and also a chance to look inward and appreciate my own business a bit more!